Bullock’s Nudibranch is a shallow water (to 30m) moderate sized (30-40mm long) sea slug often seen by divers on coral reefs. Body colour is quite variable, ranging from almost white to lilac, usually with a pale cream margin. 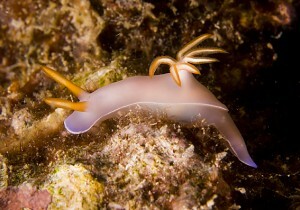 The gills and anterior (ear-like) rhinophores are usually yellow-orange with a pink base. This species is a sponge-feeder (one sponge host is known to be a species of Dysidea) and lays a yellow, spiral egg-ribbon. Indo-West Pacific: Tropical Australia as far south as Moreton Bay, Queensland.